News: three international design teams, including architects Snøhetta and Allied Works, have developed designs for Hawaii's bid to host Barack Obama's presidential library. The University of Hawaii commissioned three designs for its presentation in the battle to build the US President's official library this month, having identified a beach site adjacent to the Kaka'ako Waterfront Park. Although the University of Chicago and Columbia University in New York are the current favourites to win the bid, Hawaii is hoping to tempt Obama by turning the library into a multi-purpose centre for education, including a Global Youth Leadership Academy and a museum. All three locations have a personal connection with Obama, who grew up in Honolulu, studied at Columbia and worked in Chicago. Chicago mayor Rahm Emanuel was Obama's first chief of staff at the White House. The design team said the building was based on the idea of a coral polyp growing to create a "new environment". "The genealogy of the proposed site itself, reclaimed land sitting above what was once exposed reef shoreline, provides a historic precedent which reinforces this connection," they said. "The design concept can be seen as a synthesis of three acts; each corresponds to specific aspects and core values of the centre: Land – 'Aina; Community – Ohana; and Integrity or Righteousness – Pono," said the firm. "United under a single roof, we are reminded that we are stronger together." 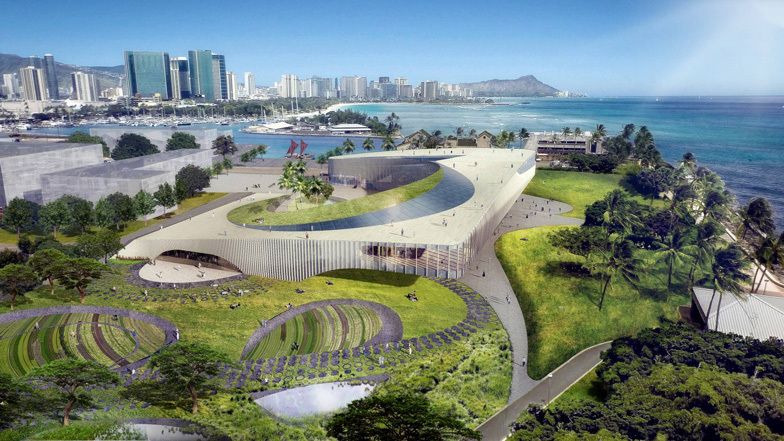 "The proposed centre celebrates the diversity of Hawaii's natural environment by expanding the adjacent Kaka'ako Waterfront Park into a campus of interconnected pavilion structures, public accessible courtyards, a ramped landscape podium, and a large park-like roof structure composed of community and public gardens," said the team. The university also commissioned Honolulu company Ferraro Choi and Associates to develop a "living building" system for the project, exploring "resource conservation and biomimicry-inspired building solutions". Once a site and host university has been confirmed, the library will be built to commemorate the president's term in office with an architect selected personally by Obama. Rumours have already linked British architect David Adjaye to the project, and the president has previously referred to Adjaye as his favourite architect. Adjaye has already designed a number of library buildings in North America, including The Francis Gregory Library and The William O. Lockridge/Bellevue Library in Washington D.C.
"These architectural renderings are not meant to be prescriptive," said the official website for Hawaii's bid. "Rather these concepts are distinct impressions of what is possible on a site with magnificent views from mauka to makai (mountainside to oceanside)." The University of Hawaii's bid is being backed by the state and municipal governments as well as a number of non-profit organisations and business sponsors. George W Bush's library completed last year at the Southern Methodist University near Dallas.